I see these kiddos pretty regularly throughout the year. So it's no surprise that when I get to their home, when Mom is running late, she trusts me with the task to pick out outfits, pull out a bit more decor and get started without her as she returns with the other half of this fabulous duo, big sister Wendi. In the meantime, lil brother Rudi and I get started with wardrobe. Then we made a party of decorating the tree, playing Christmas music and really feeling what the holiday spirit is all about, being merry! In my growing relationships with my families, I always love returning to their homes during holiday, even when it isn't as picture perfect as the family boss, Mom, would want it to be. I find myself regularly reassuring Mom that it IS perfect and what isn't picture perfect will be made up for 1,000 times over with the smiles, giggles and genuine love of the real subject of the shots, family. 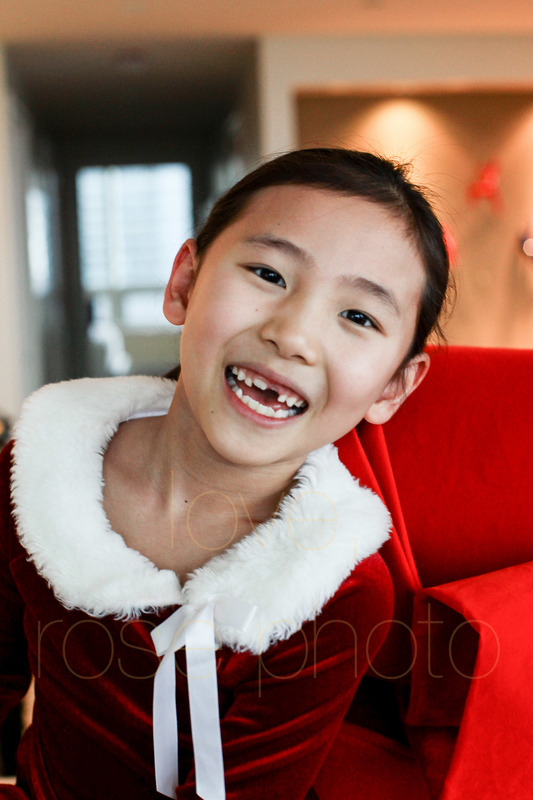 This post is as much to show off just how darn cute these two kiddos are as much as it is to highlight what is best and most beautiful from the behind the scenes of the 'perfect holiday card photo'. So much of what I share here in the blog is edited down from really full sets of imagery with tons of out takes, some meltdowns and the occasional bout of bribery to keep things moving. We all have family and we all know how crazy things can get. But truly the aim of creating the perfect photograph for the holiday card is to share with friends and family just how wonderful this time of year can be even if that means just showing the half of the tree which was decorated instead of the full tree which wasn't exactly 'picture perfect'. The feeling these photographs emit within me, the one whom captured them, is love, patience and kindness even when the metaphorical holiday sh*t hits the fan. There is no denying that in a little more than half my lifestyle shoots scheduled around holiday there are struggles which make creating the genuine sense happiness a bit of a challenge. Nonetheless, we carry on, we reroute and we find another angle to find the light, love and joy which we aim to share not only in this season but hopefully throughout the year. So let's all take a deep breath and remember perfect isn't always having everything lined up, kids dressed with a perfect bow on top. Sometimes that bow is a little off center, the kids are haywire and the tree isn't even up yet! But it's all ok because we have what matters, family.